Ignorance is Bliss. 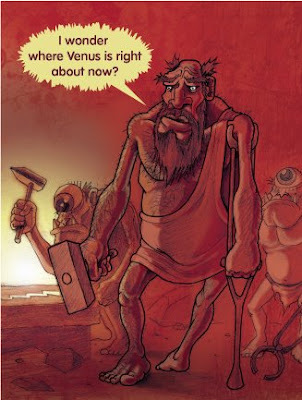 He thought Venus was just being a bit Rambunctious. When I heard about "hairy gods" I immediately thought of Vulcan as presented in "The Adventures of Baron Munchausen." Vulcan is interesting because he is the only Greco-Roman god that was deformed, or eh, handicapped. To me this seems like a bit of a oxymoron. But you know what...Old Spice Would work for him too...(unless of course you haven't seen the commercials)...like the color palette use and design...since this doesn't appear to be for IF...mind asking what illo group so I can peak around? Loving this humble monotone piece, a style to attempt Josh! Fanciful, colorful and quite narrative! I love the colors and energy in this piece. Great creative take on the topic. Love the warm colors.